Performance objectives are important for three reasons. One, they establish clear performance expectations between the assistant and supervising manager. Secondly, they are used to determine year-end bonuses and merit increases. Thirdly, and perhaps most importantly, performance objectives allow each assistant to identify areas for training, or exposure opportunities in areas he/she is interested in. Bottom line, establishing performance objectives helps YOU establish YOUR career path. Maybe the career path is to be the best executive assistant in the world, or maybe you want to move into a different department, or maybe you want to move into meeting planning–whatever your ideal career path is, performance goals can be a roadmap that you build upon year after year to help you reach your longterm career goals. And they can document you making a difference and adding value. Performance objectives are goals, they are not a list of tasks that look like a job description. All too often I’ve seen assistants submit a list of tasks as their objectives. Tasks aren’t strategic. Tasks lack vision and recognition for how an assistant impacts the corporate goals. So how can an assistant take the corporate goals and propose individual performance objectives that demonstrate the impact his, or her role can make on the company’s goals? How does an assistant right SMART Goals? Today, I’m going to walk you through the steps I recommend in my workbook, Goal Setting for Assistants. For the purpose of this newsletter, I won’t be able to provide examples, but a full example, from beginning to end is provided in Goal Setting for Assistants. Before you begin, gather this information. 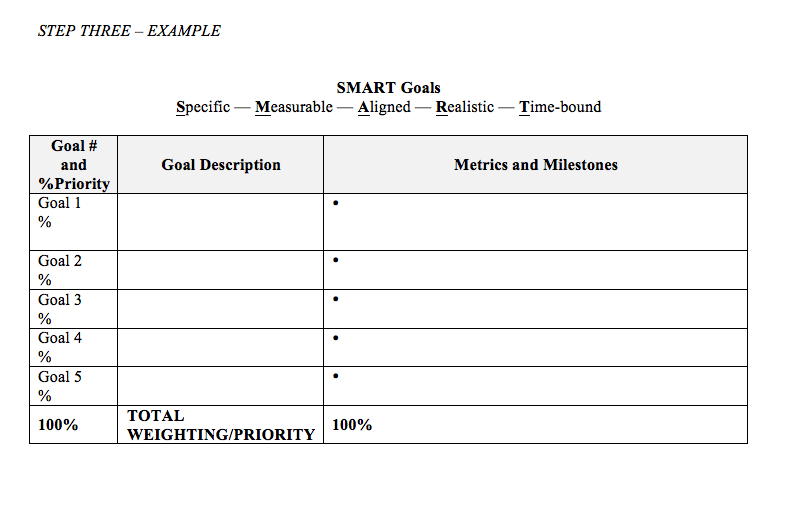 Your manager’s goals with metrics and deliverables. Your prior year performance review. Your job family matrix if available, or a job description for the next level position, or the position you are aspiring to obtain. If a description does not exist, speak to a peer and draft a description of the role. A strength is only a strength if it is a skill that you always perform above average and always perform consistently. I cannot emphasize enough the importance of the above guidance. Before adding anything to your strengths list, ask yourself, ‘Do I perform this skill exceptionally well?’ ‘Do I deliver this skill every time it is required?’ If the answer is ‘no’ to either one of these questions, it’s not a strength of yours. Do I demonstrate this skill exceptionally well? Do I demonstrate this skill consistently? How can I apply this strength to my manager’s goals? How can I have an impact on the organization and develop others with this strength? Developmental areas can be broken down into two categories: Career & Training Development and Performance Development. What constructive criticism did I receive from my manager on my last performance review? What constructive criticism did I receive from my peers? What experience, or training do I need to meet the qualifications for the next grade and level on my career path? What is taking the majority of my time at work? How can I improve my own processes and be more proficient in my role? Am I effectively using companywide resources? Am I being leveraged in the right areas and am I available to work on priority projects? How can I help reach some, or all of my manager’s, or department goals? How can I help develop team members and work with others to accomplish these goals? What areas for development will improve my performance and enhance my capabilities? Which career and training opportunities do I need to move to the next level in the job family matrix? 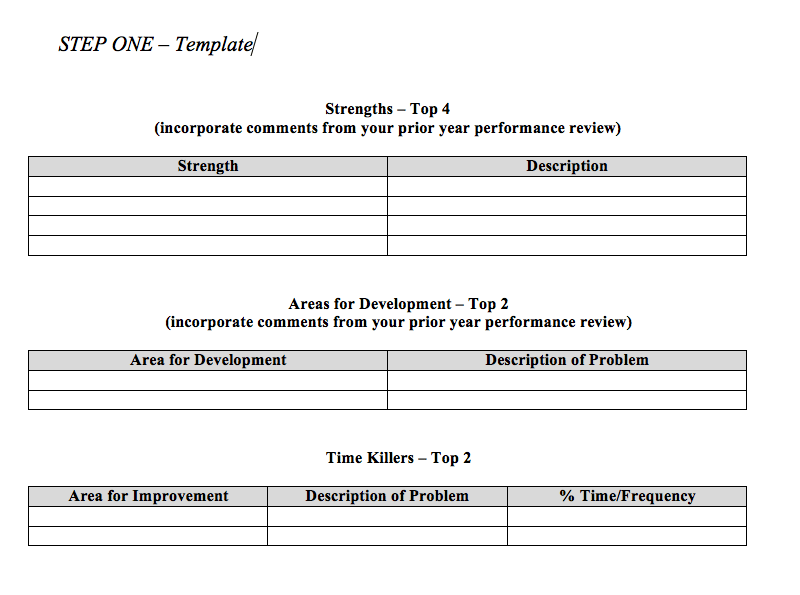 How can I use my strengths to address Time Killers and create process improvement? During this meeting with your manager you will not only collect important feedback and approval on the direction you’re proposing, but also on how you will focus your time for the next year. Most human resources departments will ask you to ‘weight’ or prioritize your goals within a 100% workload and the easiest way to prioritize your goals is to review them with your manager. A good manager will take your goals seriously and make sure that you agree on your goals. Working together, the two of you can tweak this first draft of your goals as necessary to establish clear and deliverable expectations for the future. Book a conference room to avoid distractions/interruptions. Practice presenting your draft goals with another assistant, or bouncing your ideas off a peer. Review your proposed goals with your supervisor for alignment and approval on the goals and the percentage weight. Remind your supervisor what you are working on. Get feedback and coaching as you go – don’t wait for your year-end performance review. Adjust your goals together and as necessary if the business needs change. Keep a list of your accomplishments and contributions throughout the year. Doing so will help you with your year-end review and setting the following year’s goals. Congratulations. You dedicated time to yourself, and your goals are done. You have clarity on your focus and purpose for the next year at work. You have clear expectations set with your manager. You are looking forward in a way that may not only improve your performance, but might increase your career path trajectory. In parting, learn to toot your own horn. Learn to point out your accomplishments and don’t wait for recognition. If you want to move your career forward by becoming more proficient in your role, or if you want to change your title and try something new, it’s up to you to take action. Don’t wait for your manager, or the company to do it for you.